Because someone with white-nationalist ties occupying a prime seat in the West Wing breaks so many norms, Steve Bannon’s selection as chief strategist to President-elect Donald Trump has dominated headlines. But Reince Priebus’s getting the chief of staff job matters a lot more. Yes, Bannon’s name appeared before Priebus’s on the press release. Yes, the announcement says they would be “working as equal partners” in the White House. No, I don’t really believe that signifies much. The chief of staff actually has a defined role. He oversees hundreds of members of the White House staff. He manages the daily schedule and determine access to the president. A chief strategist is just an adviser; Valerie Jarrett and David Axelrod filled this role for President Obama. Bannon may have clout, but Priebus can limit his input to the president and get the last word. With Trump, a demonstrably terrible listener who habitually takes the advice of the last person he talks to, that’s a huge advantage. Ryan Grim is correct that Bannon will have his far-right media empire to employ in a fight against the establishment—and Priebus. But Priebus will have institutional control, along with close relationships with congressional leadership and the entire Republican donor base. Priebus, in fact, has been here before. As chair of the Republican Party of Wisconsin, he fused the Tea Party and establishment wings together to help Scott Walker to victory in 2010. During a tumultuous period for Republicans he was one of the longest-serving Republican National Committee chairs in history. He’s managed to hold the GOP together even as the various factions split apart. He can handle Steve Bannon in a knife fight. For policy, this probably signals an agenda closer to that of Paul Ryan’s, from the phasing out of traditional Medicare to extreme deregulation to high-income tax cuts. That’s not because Priebus has any kind of known policy preference but because he’s been selling this agenda for many years, and remains close friends with Ryan. 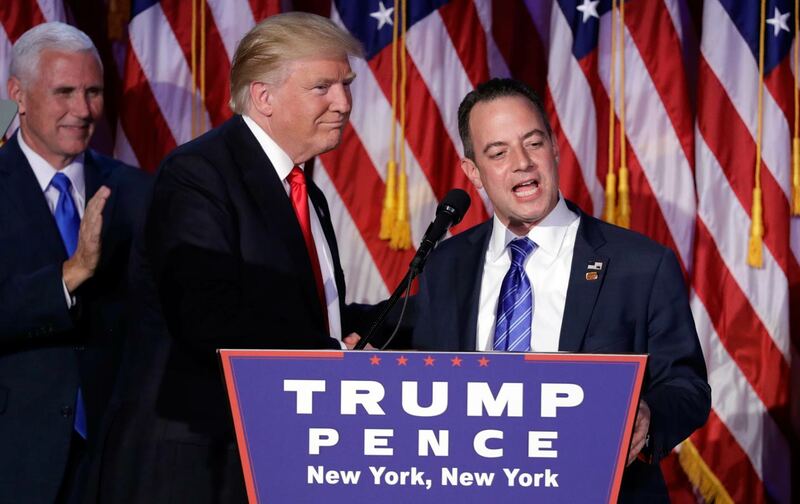 Having Priebus as chief of staff is like putting a hotline to the House speaker right in the Oval Office. That’s not in any way a good thing, nor does it “normalize” Trump. The mainline GOP agenda is just an operational version of what the Bannons of the world have been screaming for. It’s just as punitive to people of color and vulnerable communities, if not more so because it’s more likely to become reality. Underlining this point, if anything’s been out of the ordinary for the Trump transition so far, it’s just how many stalwarts from conservative politics have returned from exile. The names of transition staff read like a deck of playing cards depicting our biggest antagonists of the last 40 years, so much so that I have come to believe they were at least partly chosen to spite liberals. Kris Kobach, vote suppressor and co-author of anti-immigrant SB 1070 in Arizona, is on the transition team. So is Congressman Lou Barletta, best known for effectively criminalizing immigrants while serving as mayor of Hazelton, Pennsylvania. Florida Attorney General Pam Bondi, who fired career prosecutors working to indict bankers for fraud and took an illegal $25,000 gift from Trump’s foundation right when she decided to stop investigating Trump University, serves on the team too. Ken Blackwell, who in 2004 as Ohio secretary of state prevented enough Democratic voters from casting ballots to hand the state to George W. Bush, is overseeing domestic issues. I was almost certain Reagan’s attorney general Ed Meese was dead, but he’s popped up too. David Malpass, the guy doing the hiring for the Treasury Department, was literally the chief economist for Bear Stearns before it collapsed. Myron Ebell is as vocal a climate denialist as exists in America; he’s staffing up EPA. Paul Atkins, the Bush-era SEC commissioner most associated with eliminating leverage restrictions at the major banks, a key driver of the financial crisis, will stand up independent regulatory agencies. Rounding out transition staff are a passel of K Street lobbyists (Trent Lott’s involved) and seemingly half the Heritage Foundation. Meanwhile, the horror show in the projected cabinet doesn’t end with Newt Gingrich and Rudy Giuliani. John “lose ten stories of the UN building” Bolton could become secretary of state. Former partial-term governor Sarah Palin, secretary of the interior. Pyramid enthusiast Ben Carson, secretary of education. Rick Scott, whose health-care company committed what was then the largest healthcare fraud in history in the 1990s, might be health and human-services secretary. Newly unemployed and notably racist sheriff Joe Arpaio? How about Homeland Security Secretary Arpaio? Stephen Hadley, an architect of the Iraq surge, might head up the Pentagon. Jose Rodriguez, who helped build the Bush torture program, could run the CIA. Potential Treasury secretary Jamie Dimon—he says he doesn’t want the job—was, I think, added just to include every liberal boogeyman in recent US history. This isn’t just the swamp; it’s whatever got dredged from the bottom of the swamp. But while the lineup is certainly a virulent strain of who the Republicans have to offer, it also indicates an amazing continuity with the party’s recent past. All these people have held power before. So has Priebus, the face of the GOP for the last six years. Bannon notwithstanding, there simply aren’t many in the mix that would signal total deviation from the normal conservative agenda. As populist parties move from opposition to proposition, they usually sand off their rough edges and seamlessly replace the party on their ideological side. For all the reading between the lines of Trump statements and policy briefs, personnel is policy. Early returns indicate it’s just the same old gang.